What are the different types of leishmaniasis? What causes leishmaniasis? How does leishmaniasis spread? What are risk factors for leishmaniasis? What are leishmaniasis symptoms and signs? How do health care professionals diagnose leishmaniasis? What is the prognosis of leishmaniasis? Is it possible to prevent leishmaniasis? Where can people get more information about leishmaniasis? Leishmaniasis is on the World Health Organization's list of "neglected tropical diseases." A parasite that spreads to humans through the bite of infected Phlebotomus sand flies causes leishmaniasis. Leishmaniasis occurs in several temperate and tropical countries of Central and South America (New World), the Middle East, East Africa, and East Asia (Old World). In other regions, such as the United States and Europe, travelers from affected areas may have leishmaniasis. The most common type of leishmaniasis is cutaneous leishmaniasis. This causes nodules or sores to form on the skin, including the skin of the face. Affected people may have a single lesion or many lesions. Sores heal slowly over months to years and leave scars. 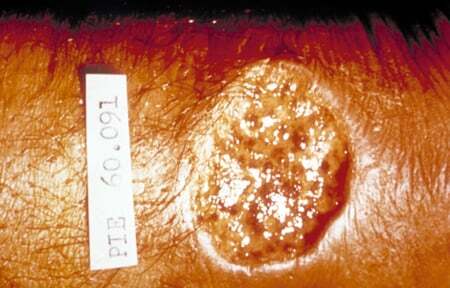 Cutaneous leishmaniasis is most common in Central and South America, the Middle East, and North and East Africa. Another type is visceral leishmaniasis (also called kala-azar or dum-dum fever). Parasites infect the tissues of major organs, especially the liver, spleen, and bone marrow. Serious cases are usually fatal if untreated. Most visceral disease occurs in East Africa, Brazil, and India. Less commonly, people who have had cutaneous leishmaniasis may get new sores in the mucous membranes of the mouth, nose, and larynx even years after the cutaneous leishmaniasis has resolved. This is mucocutaneous leishmaniasis and only occurs in limited areas of Bolivia, Brazil, and Peru. HIV-visceral leishmaniasis (HIV-VL) co-infection has emerged in southern Europe and elsewhere. People with HIV are especially prone to Leishmania as an opportunistic infection, and co-infection worsens and accelerates the progression of HIV. Treatment consists of medications that are specific to the type of leishmaniasis, the species of the parasite, and to the country in which the patient acquired the disease. Consultation with the CDC and an infectious disease consultant can assist with diagnosis and treatment of cases imported into the United States. Those who work in or travel to affected areas can reduce their risk by using insect repellents, protective clothing, and bed nets. These precautions are especially important from dusk to dawn, when the sand fly is most active. Leishmaniasis is a "vector-borne" infection, meaning that an insect from another host or "reservoir" (disease carrier) transmits it. Various animals, including dogs, rats, sloths, cattle, and humans can act as hosts for Leishmania parasites. 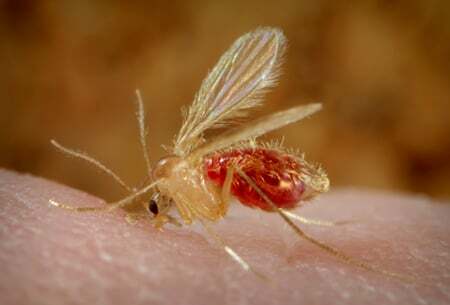 Leishmania spreads to people through the bite of over 30 Phlebotomus genus of sand flies. These flies are only up to 2 mm long, they make no sound, and their bite can be painless. The females need a blood meal to produce eggs. Phlebotomine flies that transmit Leishmania live in the warm tropical and subtropical areas of the world. As climate changes and temperatures shift, tropical diseases are shifting, as well. Health researchers expect human leishmaniasis to follow the spread of Phlebotomus flies into regions of increasing warmth and humidity. Human migration and increasing urban encroachment into rural areas also offer increased opportunities for spread of these organisms. While many Western doctors are unfamiliar with it, leishmaniasis has a tremendous human impact on a global scale. It is difficult to pinpoint how many cases occur globally, since most may occur in rural, poor areas without established systems of reporting, but the World Health Organization (WHO) reports over 1 million cases of cutaneous (skin) leishmaniasis in the last five years. About 300,000 cases of visceral (organ) leishmaniasis occur yearly, with over 20,000 deaths. Over 1 billion people live in areas where Leishmania is common. Despite its prevalence, few Western clinicians are aware of it, and it remains on the WHO's list of "neglected tropical diseases." Research, treatment, and eradication of diseases affecting very poor and resource-limited areas often require outside investment. Leishmaniasis occurs primarily in South America, East Africa, the Middle East, Southern Europe, and Asia. In traditional or older terminology, geography divides leishmaniasis. "Old World" (Eastern hemisphere) leishmaniasis occurs in tropical parts of Asia, the Middle East, East and North Africa, and southern Europe. The Old World species include Leishmania major, L. tropica, L. donovani, and others. "New World" (Western hemisphere) leishmaniasis occurs in tropical parts of Mexico and Central and South America. New World species include L. mexicana, L. amazonensis, L. braziliensis, and others. Cases in the United States and Europe are usually occur in travelers or immigrants from these endemic areas. In fact, due to the increasing popularity of "adventure travel" and "ecotourism" to Central and South America, new cases of leishmaniasis are on the rise in the U.S. Given the general unfamiliarity and limited knowledge about this parasitosis, a comprehensive guideline for diagnosing and treating these cases appeared in the journal of the Infectious Disease Society of America Clinical Infectious Diseases (Clin Infect Dis) in 2016. There have been autochthonous cases (those acquired without travel) described in the U.S. In 2012, 13 people acquired cases of cutaneous leishmaniasis in Texas and Oklahoma without travel. This suggests spread of the sand fly vector and parasite into the U.S. and/or spread of human habitats into more rural areas. Large epidemics of leishmaniasis can occur among people displaced into crowded urban areas through war or migration, or when high rates of malnutrition weaken people in affected regions. Generally, dogs and rodents are the reservoir for most species of Leishmania. In poverty-stricken, densely populated areas, humans may become the primary "reservoir" and source of recurrent infection with leishmaniasis, particularly with L. donovani. This is "anthroponotic" transmission. Many species of Leishmania cause leishmaniasis, a very diverse infection described by syndromes according to what part of the body it affects most. Several Leishmania species cause three syndromes: visceral (kala-azar), cutaneous, and mucocutaneous leishmaniasis. Each type may occur more commonly in certain parts of the world than others and depends on the species of Leishmania. It may take weeks to months or even years for symptoms to appear after the infecting bite. Cutaneous leishmaniasis (CL) is the most common form of leishmaniasis and, as the name implies, the skin is the predominant site of infection. People acquire most cases of CL in the Middle East, East Africa, Asia (Old World), and Central and South America. Less commonly, cases occur in other countries, including Southern Europe. Of note, U.S. troops stationed in Iraq and Afghanistan have acquired CL. Some species of Leishmania cause CL but also spread to the tissues of the face and upper respiratory tract and cause a mucocutaneous form of the disease many years later. Mucocutaneous leishmaniasis (ML) occurs only in the New World and is most common in Bolivia, Brazil, and Peru (the "mucosal belt" south of the Amazon basin). ML causes terribly disfiguring and progressive destruction of the nose, nasal septum, mouth, and mid-face. Untreated, death results from secondary infections like pneumonia. A more severe form of CL with many lesions, disseminated CL may occur in people with poor immunity. It may appear very similar to lepromatous leprosy or fungal infection. In visceral leishmaniasis (VL), the parasite spreads from the skin via the blood and lymph fluids to the vital organs of the body, particularly the liver, spleen, and bone marrow. This type of infection is less common but more life threatening than CL. Post-kala azar dermal leishmaniasis occurs in India and Sudan. Skin lesions may appear months to years after apparently healed VL. VL is also an important yet under-recognized opportunistic infection in HIV-infected people. There have been cases of HIV-VL reported primarily in southern Europe and the Mediterranean where 70% of those with VL are HIV co-infected, however, over 30 countries have reported HIV-VL cases, including North Africa and Latin America. HIV-VL incidence in Brazil has increased from 0.7% in 2001 to 8.5% in 2012. People with immune suppression due to HIV are 100 to 2,000-fold more likely to develop severe VL, because they lack the cell-mediated immunity needed for defense and recovery from it. HIV-VL co-infection then leads to accelerated progression of HIV infection to advanced disease. Treatment failure and relapse of VL is high in these individuals, although anti-retroviral (anti-HIV) therapy helps improve cell-mediated immunity and may have some anti-leishmanial effects as well. Because the parasites multiply in high number, these individuals also become effective human reservoirs, often transmitting both HIV and Leishmania via IV drug use. Of concern, VL may follow spread of HIV to new geographic areas when co-infected populations migrate. 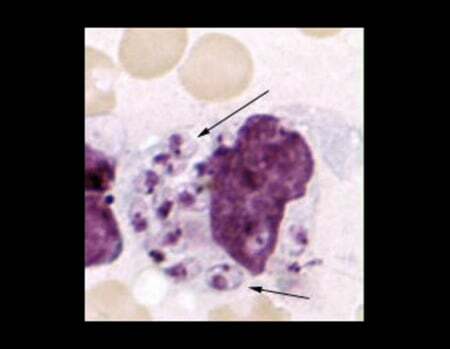 Intracellular protozoal parasites from the Leishmania genus cause leishmaniasis. The organisms are microscopic in size. Over 20 species of Leishmania affect humans. The life cycle is relatively simple. Uninfected sand flies acquire the parasite by feeding on infected people or animals. When the sand fly bites a human, it injects small numbers of parasites that mononuclear blood cells rapidly take up. This stage is the promastigote stage. Once inside the human mononuclear cells, the parasite enters the amastigote stage and begins to multiply and infect other cells and tissues. Depending on the species, the parasites may spread via blood and lymph fluid to other body sites, such as the skin or major organs. Blood transfusions and IV drug users sharing contaminated needles transmit parasites. A pregnant mother may transmit Leishmania to her fetus. The major risk factor for leishmaniasis is exposure to infected phlebotomine sand flies. The sand flies are most active from dusk to dawn and are more common in rural areas. Casual travelers do not usually visit these areas at night, so infection is more common in adventure travelers, missionaries, humanitarian aid workers (such as Peace Corps workers), soldiers, and those with occupational activities that require them to live in rural areas. In healthy people, the degree of immune response to leishmaniasis appears to be genetically determined and is primarily cell-mediated; antibodies are not protective. CL lesions in people with normal immunity will resolve without treatment in several weeks. These individuals are immune to CL thereafter. In visceral leishmaniasis, a weak cell-mediated immune response is associated with more severe disease. Factors that weaken cell-mediated immunity include malnutrition and co-infection with the human immunodeficiency virus (HIV). The cause of mucocutaneous leishmaniasis remains unclear, but an overactive immune response may play a part. Interestingly, Leishmaniavirus can infect the Leishmania parasite itself, which may cause the parasite to be more dangerous by overstimulating the inflammatory response from the human immune system. Leishmania may live quietly for years in the body and then begin to multiply (reactivate) if the person's immune system becomes suppressed. For example, people with HIV who are being treated with anti-HIV drugs and whose immunity is improving may develop CL or VL as part of an immune reconstitution syndrome (this refers to hidden infections that reveal themselves as the body begins to fight them). Thus, people born in a country with leishmaniasis and those who have had travel-related exposure are at risk if they become immunosuppressed by conditions such as chemotherapy, use of steroids, or infection with HIV. Patients who have previously had cutaneous leishmaniasis acquired in certain parts of the New World are at risk for developing mucocutaneous leishmaniasis. high levels of immune globulin in the blood (hypergammaglobulinemia). In very advanced disease in India, the skin may turn dark (hyper-pigmentation), which prompted VL to be called "kala-azar," which means "black fever" in Hindi. The hyper-pigmentation is due to increased melanin in the skin. Inflammatory products due to VL stimulate the pituitary gland to make high levels of adrenocorticotropic hormone, which increases melanin production. Hyper-pigmentation usually resolves with effective treatment of VL. It no longer appears as often due to earlier treatment. It also affects the kidney, which may lead to renal failure, although some of the anti-leishmanial drugs may also be responsible for kidney toxicity. Leishmaniasis may affect other organs, including the bowel and the lung. There are a host of other names for cutaneous or dermal leishmaniasis (CL), including "pian bois" and "chiclero ulcer" in South America, "Aleppo boil" in the Middle East, and "Delhi boil" in India, among others. The site of the sand fly bite usually forms a raised papule that expands and ulcerates, with a heaped up border on the edges. The disease becomes manifest over several weeks. There may be only one lesion, or multiple lesions may appear over time. The skin lesions take on a variety of appearances and may resemble acne, warts, or psoriasis. They may look like large scaly, ulcerated plaques or form shallow ulcerated nodules. The lesions may be dry or weeping and are not usually painful unless secondarily infected by bacteria. Sores occur predominately on the extremities and face. They heal over months to years, leaving scars that often resemble old burns. In severe cases, such as diffuse cutaneous leishmaniasis, nodular lesions may occur widely and last for years or even for life. Mucocutaneous leishmaniasis (ML) involves the nose, mouth, and larynx. It is less common than VL and CL. Initially, the patient experiences a nodule at the site of the sand fly bite with symptoms consistent with CL. Subsequently, mucocutaneous involvement leads to nodules inside the nose, perforation of the nasal septum, and enlargement of the nose or lips. If the larynx is involved, the voice changes as well. Ulcerated lesions may lead to scarring and tissue destruction that can be disfiguring. In countries where the disease is common, medical professionals may presume that patients with compatible clinical symptoms and findings have leishmaniasis. Other patients require definitive diagnosis, done by examining tissue under a microscope (Figure 5) to detect the parasite or through a blood test to detect antibodies (see below). There is a skin test called the Montenegro skin test, but it is imperfect and not used for diagnosis of disease. The guideline, "Diagnosis and Treatment of Leishmaniasis: Clinical Practice Guidelines by the Infectious Diseases Society of America (IDSA) and the American Society of Tropical Medicine and Hygiene (ASTMH)," published in 2016, recommends full thickness skin biopsy for diagnosis of CL, which allows testing for more than one infection. Bone marrow aspirate is preferred for diagnosis of VL by examining it for amastigotes and sending to a reference laboratory for polymerase chain reaction (PCR) and/or culture. Lymph nodes, liver, and "buffy coat" (white cells) from a blood specimen may also be used. The latter may be helpful in immune-suppressed individuals. Medical professionals can culture the specimen on special media, which allows the parasite to multiply, making detection easier under the microscope. In the United States, physicians should contact the Centers for Disease Control and Prevention (CDC) to obtain testing advice and the appropriate media. Anti-leishmanial antibodies in the blood can be detected using enzyme-linked immunosorbent assays (ELISA). Antibody assays are usually positive in VL but are not useful in CL and ML, because these conditions do not stimulate reliably and/or consistently elevated antibody titers in the blood. Antibody assays may be falsely negative in immune-suppressed individuals with VL, and health care providers should use other diagnostic methods. It is important to remember that there are many diseases that can cause fever, weight loss, skin lesions, or enlargement of organs. Conditions like malaria, typhoid fever, toxoplasmosis, Chagas disease, schistosomiasis, tuberculosis, histoplasmosis, syphilis, leprosy, and others may be present with or mimic leishmaniasis. It is important not to miss other conditions, as well. Because of the diversity of species and manifestations, and lack of extensive data, there is no drug or treatment of choice for leishmaniasis. Per the IDSA guideline and CDC recommendations, medical professionals must individualize treatment based on the species, type of syndrome, and geographic area. Physicians should consult with CDC experts and an infectious disease specialist. The only FDA-approved anti-leishmanials in the U.S. are liposomal amphotericin B and oral miltefosine. Amphotericin B has frequent side effects, including renal toxicity, and is FDA-approved for VL. Generally, patients tolerate miltefosine (Impavido) well, and it is FDA-approved for CL, VL, and ML caused by Leishmania braziliensis, L. panamensis, and L. guyanensis. It is the first highly active oral agent for VL. Ketoconazole and fluconazole are azole antifungals that may be effective against certain species. Patients may use traditional agents based on antimony, called pentavalent antimonial (SbV) compounds, intravenously or intramuscularly. Sodium stibogluconate (Pentostam) is available in the U.S. for VL through the CDC Drug Service under an investigational new drug (IND) protocol. Some areas, such as the Indian state of Bihar, report high rates of drug-resistant VL. Short-course amphotericin B or even single-dose liposomal amphotericin B has been successful in Bihar. Pentamidine has been used second-line for VL and has a number of toxicities. CL in a person with normal immunity may not require any treatment, depending on severity of the lesion, since it will resolve on its own in several weeks. Health care providers sometimes simply monitor cases with few lesions that are small and appear to be healing. More significant cases of disease is treated with medications, but treatment recommendations vary with where the disease was acquired and the species of Leishmania (if known). Possible treatments for cases arriving in the U.S. include oral ketoconazole (Nizoral, Extina, Xolegel, Kuric) or topical compound of 15% paromomycin (Leshcutan). Other treatments include local heat therapy (requires local anesthesia) or repeated cryotherapy with liquid nitrogen over several weeks. Mucocutaneous leishmaniasis is less common, and there is no clear consensus on treatment; as such, it's important to consult with the CDC and an infectious diseases physician. Cutaneous leishmaniasis is rarely fatal but may result in disfiguring scars. People with CL should be educated about the manifestations of ML and monitored periodically for one or two years for this. 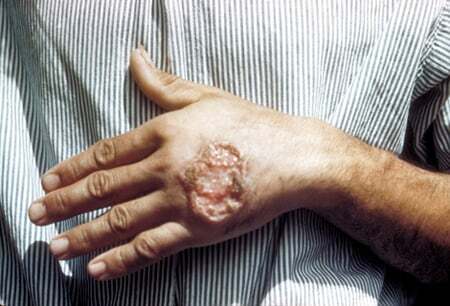 Untreated, visceral leishmaniasis is usually fatal. Death can result directly from the disease through organ failure or wasting syndromes. It may also occur due to secondary bacterial infection, such as pneumonia. Physicians should test patients with leishmaniasis for HIV because co-infection worsens both conditions if they are not treated together. There is no vaccine for leishmaniasis, but some countries have practiced leishmanization in the recent past, using L. major to produce self-limited cases of CL that healed with immunity. While successful in reducing disease, it was discontinued due to cases of nonhealing lesions; ongoing research into non-live or milder strains seeks to revive safer options. The best way to prevent leishmaniasis is to avoid the bite of the sand fly. Simple insect precautions, including protective clothing (long sleeves, shirts tucked into pants, long pants, and socks) and insect repellents containing N, N-diethylmetatoluamide (DEET) reduce the risk of bites. Because phlebotomine flies are most active in the evening and nighttime, people should make an effort to reduce exposure in sleeping accommodations. Sand flies are smaller than mosquitoes. People may use finely meshed bed nets impregnated with insecticides such as permethrin (Elimite, NIX) or deltamethrin. Tuck bed nets under mattresses. Treat clothing with permethrin to repel insects and retreat the clothing every five washings. Treat domestic dogs that must travel to areas where Leishmania is transmissible with topical agents that kill or repel insects, such as Adantix, or an insecticide-containing collar, such as Scalibor, which contains deltamethrin. Keep dogs indoors in the evenings, as well. An anti-leishmanial canine vaccine (Cani Leish) is available in Europe. From a larger perspective, treatment of infected animals and people along with judicious use of insecticide has the potential to reduce the burden of infection in endemic areas. The CDC has an excellent web site with information regarding leishmaniasis: http://www.cdc.gov/parasites/leishmaniasis/. Additional information is available from the World Health Organization: http://www.who.int/leishmaniasis/en/. Amato, V.S., F.F. Tuon, A.M. Siqueira, A.C. Nicodemo, and V.A. Neto. "Treatment of Mucosal Leishmaniasis in Latin America: Systematic Review." Am J Trop Med Hyg 77 (2007): 266-274. Aronson, Naomi, et al. "Diagnosis and Treatment of Leishmaniasis: Clinical Practice Guidelines by the Infectious Diseases Society of America (IDSA) and the American Society of Tropical Medicine and Hygiene (ASTMH)." Clinical Infectious Diseases 63.12 Dec. 15, 2016: e202–e264. <https://doi.org/10.1093/cid/ciw670>. Croft, SL, Sundar S, Fairlamb AH. "Drug Resistance in Leishmaniasis." Clinical Microbiology Reviews 19.1 January 2006: 111-126. Daneshbod, Y., A. Oryan, M. Davarmanesh, S. Shirian, S. Negahban, A. Aledavood, M.A. Davarpanah, H. Soleimanpoor, and K. Daneshbod. "Clinical, Histopathologic, and Cytologic Diagnosis of Mucosal Leishmaniasis and Literature Review." Arch Pathol Lab Med. 135 (2011): 478-482. Desjeux, P. "Prevention of Leishmania donovani Infection." BMJ. 341 Dec. 29, 2010: c6751. García, A.L., R. Parrado, E. Rojas, R. Delgado, J.C. Dujardin, and R. Reithinger. "Leishmaniases in Bolivia: Comprehensive Review and Current Status." Am J Trop Med Hyg. 80 (2009): 704-711. "Leishmaniasis." Companion Animal Parasite Council. July 1, 2014. <https://www.capcvet.org/guidelines/leishmaniasis/>. Scott, P. "Leishmania -- a Parasitized Parasite." N Engl J Med. 364 (2011): 1773-1774. Sundar S, Chakravarty J, Agarwal D, et al. "Single-Dose Liposomal Amphotericin B for Visceral Leishmaniasis in India." N Engl J Med 362 (2010): 504-512. Switzerland. World Health Organization. "Leishmaniasis and HIV Coinfection." <http://www.who.int/leishmaniasis/burden/hiv_coinfection/burden_hiv_coinfection/en/>. United States. Centers for Disease Control and Prevention. "Parasites -- Leishmaniasis -- Resources for Health Professionals." Aug. 21, 2017. <https://www.cdc.gov/parasites/leishmaniasis/health_professionals/index.html>.